← What Paint Color Can I Use if I Have Giallo Fiorito Granite? Paprika! I finally found the color I love in the JOE Collection at High Point Market 2013. I’ve been talking, blogging and suggesting this hue since 2009 – that’s a long time to wait for a color that I think is perfect for the home. 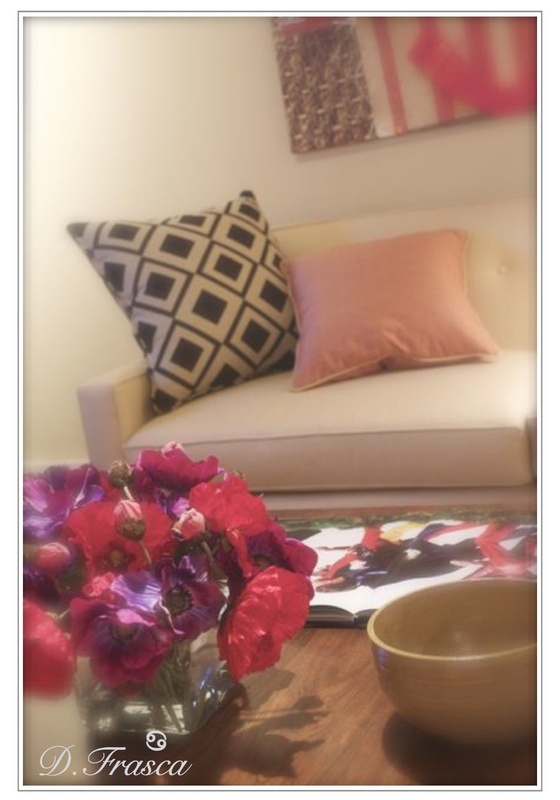 As I talk more about these colors, I want to first show you my Olioboard that highlights the Benjamin Moore paint colors that I know are a perfect fit for these Sunbrella fabrics and the look of Joe Ruggiero’s Collection. I chose to showcase Benjamin Moore’s Color Stories collection because the JOE line is so “clean and bright” in color if I used a paint color that contained black, the wall would just look dirty and defeat the purpose of these Sunbrella fabrics. Let me backtrack just a little. Back in 2009 I wrote a blog post on the color that I think should be popular for 2010, simply titled My Color Prediction for 2010. Well Pantone chose Turquoise as their color that year and Benjamin Moore chose some New Beginnings palette which incorporated several hues which is fine but not pinpointed. The reason I chose Salmon, which is a variation of Paprika, is because prior to 2010, eating healthy and the heath trend in general was rampant. It was obvious to me that since everyone was surrounding themselves in healthy food, exercise and vitamins that the color “Salmon” was the natural color choice for both the runways and the home. I even went as far as naming my color of the year “Omega 3” and call it my own. Needless to say, 2010, 2011, 2012 and even 2013 went by without a consideration to this healthy hue. 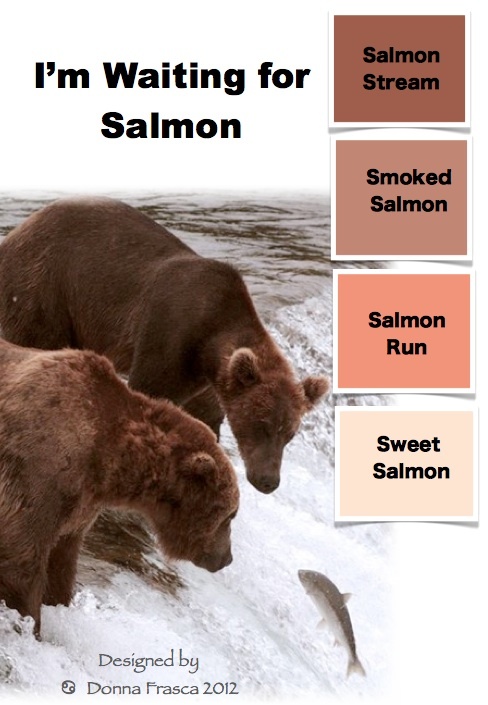 Back in 2012 I even designed this color board letting everyone know that I’m still waiting for the salmon color trend to catch on but it never did. Whenever I mentioned salmon in my writings, the public told me that it’s too much like the peach and sea-foam combo of the 80’s but people, you couldn’t have been more wrong! I was tickled to death when I saw Joe Ruggiero’s collection and it was very, very, very close to the palette that I felt and still feel is perfect for the home – and our closets! Even “Paprika” which is the Sunbrella fabric name, is good for you! It a spice made from ground, dried bell or chili peppers which we all know are very healthy choices. As a Color Expert, when I choose color for a home, it’s more than just picking a color that looks pretty. I THINK about the color and what it means since we all know that color peaks feelings and emotions in us. I’m sure the families who choose The Joe Ruggiero Collection will feel happy in his color palettes because it was designed that way – happy colors for family and for people in general. THAT my friends is what the right color choices and design is all about! Another great thing about this collection is it’s versatility. I’m not taking about the style and fit right now but the color palette. 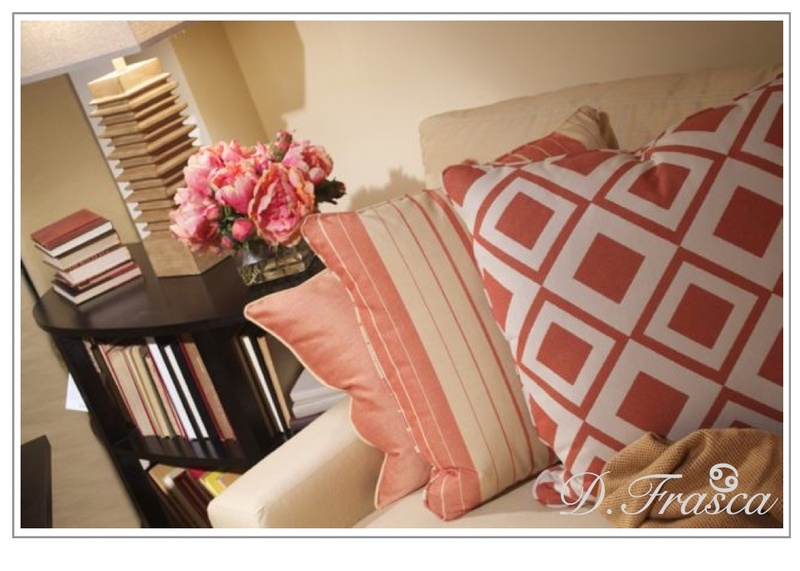 You can choose so many other colors to bring into your home to change this look around. From navy to brown, black and right back to white with just about every hue in between – that’s a lot of color to choose from!!!! So whatever color you choose to go with the JOE collection, you have some great paint color suggestions here to get you started. Be sure to click on my Olioboard link to see the names of the colors I recommend. 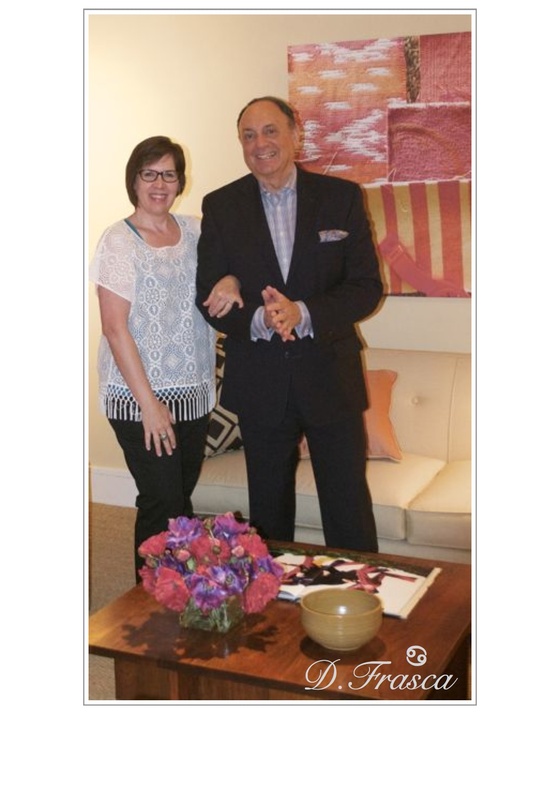 Joe Ruggiero, it was a pleasure meeting you at Miles Talbott in High Point Market and thank you for designed the colors I’ve been waiting for since 2009. This entry was posted in 28173, Benjamin Moore, Charlotte, Color, Color Specialist in Charlotte, Color Stories, Color Tips, Color Trends, decor, Design, HIgh Point Market, Home Decor, Popular Colors and tagged benjamin, Charlotte, color, color expert, color trends, donna frasca, high point, high point market, Joe, Joe Ruggirero collection, moore, olioboard, paint color, papriak, sunbrella. Bookmark the permalink. 1 Response to The Joe Ruggiero Collection, Simply JOE is What I’ve Been Waiting For! YES!!!!! I could not agree with you more. Great colors and fabrics. One of my friends is about to embark upon decorating a ‘peach’ dining room. I think this is right in line with her mind’s eye. Isn’t it funny how we continue to love the same colors, but insist upon tweaking the names over the decades?